Two friends of GDS have written great blog posts in the last week. So great, we thought we'd mention them here, so you can read them too. First is Kit Collingwood-Richardson, formerly Head of Digital at the Office of the Public Guardian, and now newly installed as HMCTS service manager at MoJ Digital. Kit gave a talk called "Digital leadership" to a gathering of service managers here at GDS earlier this week. She’s posted her slides on the web (and unlike a lot of slides posted on the web after the event, they make good sense on their own, even without Kit explaining them in person). Kit says a lot of wise things in this talk, but we particularly liked her phrases “do things small, it makes them deliverable” and “most Gantt charts are fairy tales”. We were also interested in the bit about 'digital maturity' towards the end. Kit describes that as a team moving from project thinking (where the focus is on time and budget), through to product thinking (focus on users and shippable code) to service thinking (focus on team and service quality). Another thing. 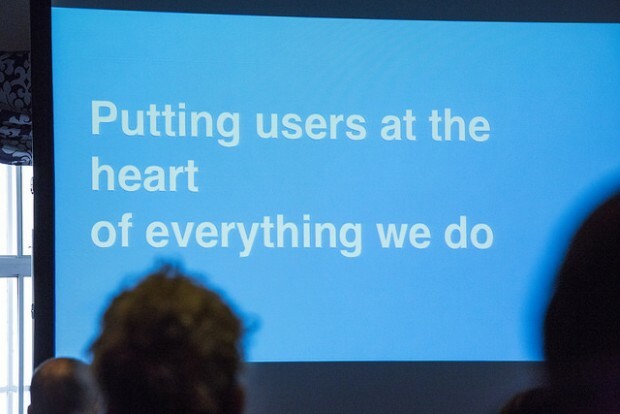 This time, a blog post by former GOV.UK product manager Sarah Prag, explaining the importance of starting a project the right way: with a discovery phase. Too often, she writes, teams find "their work began when someone decided the organisation should be using a particular system, so they’re busy trying to implement that, or someone thought a particular process should be put online, so that’s what they’re doing. They’ve been presented with a solution and told to make it work." The likely result is a disenchanted team and an unsatisfactory end result. The best way to avoid that is to invest a few weeks in discovery first, allowing time for a small multidisciplinary team to "focus on users and their needs, and to come up with realistic plans that the whole team can buy in to." Discovery is driven by conversation rather than documentation, so the approach needs to get people talking and thinking and sketching and asking questions. Kit's comment about the importance of moving from Project to Product to ongoing Service thinking made me wonder whether GDS has come across anyone who's set up an ongoing 'Net Promoter' engagement/listening and improvement system? People often know about the idea of the 'Net Promoter Score' - but don't realise it's meant to be part of an ongoing system of listening to public/stakeholders/users and making improvements (and closing the loop letting them know what you've done!). Where can I find out who's using NPS successfully in the public sector? (I'm new in an ALB role, so don't yet know where to look). Obviously the NHS has its well-known 'Friends and Family' test, based on the main Net Promoter question ('On a scale of 0 to 10 would you recommend...etc') but I think they left out the vital supplementary question: what action could we take that would improve the score you gave? (Not sure the Civil Service staff survey asks that question about the most pressing improvements either). I know that NPS is being used by some schools but I don't know where. My kids' Primary School has used it, at my suggestion. But the Head doesn't know where to find others that are using it, to share benchmarks, best practices for the process. Would be great if there was a central repository of NPS benchmarks, best practices etc.